Fonds consists of material relating to Southam's professional life, and personal interests. The fonds is divided into ten series which reflect the many items found in fonds. 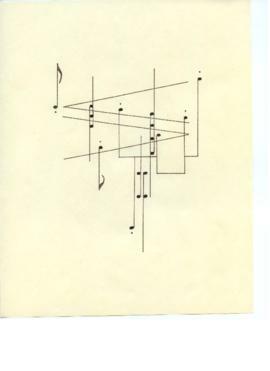 Materials in the fonds include recordings (both by Southam and by others), scores (both by Southam and others), programmes, articles about Southam, photographs (personal and professional), material used by Southam in mixed-media presentation, and other material. Material was donated to Banff Centre Archives by the estate of Ann Southam in 2013. The material was organized and shipped to the Archives by Tamara Bernstein. Many notes by Tamara were found in the archival collection, and explain provenance or importance of materials, these notes were signed "TB", and when helpful they have been left with the material in the fonds. Arrangement was imposed by two archivists and Tamara Bernstein. An attempt was made to preserve only the archival material in the donation. Published materials were, in some cases, donated to the Library or housed in a Special Collection. Contact the Archives for a full listing of material that arrived with the donation. 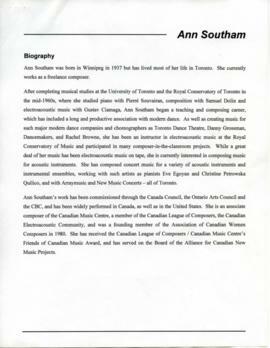 Copyright in Southam's musical works remains with the Canadian Music Centre (CMC). See ACWC (Association of Canadian Women Composers fonds) for additional materials on the ACWC. Only some material in the fonds has been digitized. Please contact Banff Centre Archives to explore the whole fonds.